ECO-FRIENDLY SOLUTIONS. A TRULY AMAZING FORUMLA. The EPA Registered, NSF Certified PoolRx family of products are all natural, non-corrosive and do not adversely affect water chemistry. Normal Pool Chemistry Ranges Required. The PoolRx method is proven to provide better sanitation with less chemicals providing a healthier, safer, eco-friendly swimming environment. Are you tired of having to buy expensive minerale cartragies for your frogger or natuer to feeder here is your answer. 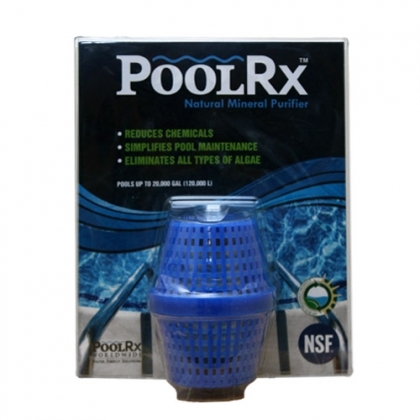 There is no seprate feeder for the POOL RX just drop it in your pump basket and you are set for 6 months or one pool season for the midwest.